Widan Cleaning Services - AED 99 for 4 hours, AED 119 for 6 hours, AED 179 for 8 hours. We are Widan Cleaning Services and we own and operate a professional, local, family run, non-franchise cleaning business based at the UAE. We are a professional team dedicated to giving our clients the most professional and personal service possible. As a local family business, we take great pride in our work and always work to the highest standards. We offer Cleaning services and solutions for every type of issues. 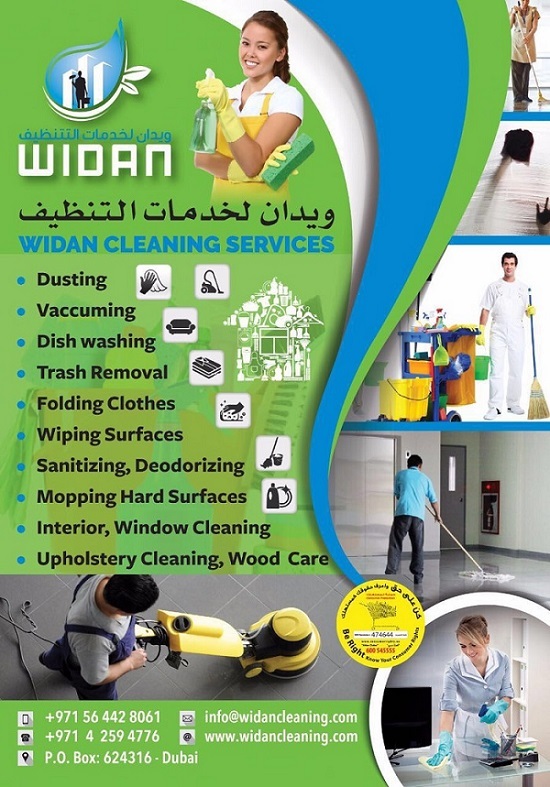 Widan Cleaning is available on your schedule, so don't hesitate to call any time of the day or night. We understand Cleaning issues aren't courteous enough to happen between convenient business hours, but Widan Cleaning is. We're the courteous Cleaner when you need us most, and we never charge overtime.